Australia’s former visionary 21st Prime Minister had, as they say, a good innings―he was 98 and got to share all but the last two years of his life with his beloved wife―and he leaves behind a country that he, in the three short years events conspired to give him at the helm, reshaped from a colonial backwater into a modern, confident, more equitable, globally engaged nation. Why do I feel sad? 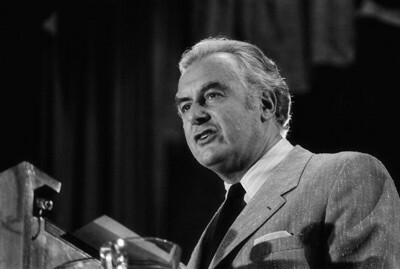 After all, the political supernova that was Edward Gough Whitlam burned brightly in the early 1970s, when I was far too young to be engaged in the political sphere. I’m sad because the country that Whitlam thought Australia could become is currently far from its best self and seems to be travelling in the opposite direction with its current treatment of refugees, stirrings of xenophobia, attacks on wider access to higher education, disregard of the natural environment, and on it goes. I’m sad because Gough’s passing extinguishes a certain optimism with regard to politics. In 2009, on the mantra of hope and change, writ large on those iconic portraits by Shepard Fairey, Barack Obama was swept into the White House, only to disillusion the believers with more of the same cynical politics and legislative inertia of our times. Gough was elected on the chant of “It’s time” at a time when there was real social change happening across the globe — and he proceeded at breakneck pace to catch up and in some cases surpass the zeitgeist of his time. The decision we will make for our country on 2 December is a choice between the past and the future, between the habits and fears of the past, and the demands and opportunities of the future. There are moments in history when the whole fate and future of nations can be decided by a single decision. For Australia, this is such a time. It truly was time. With his crash through or crash approach, his government scrapped conscription, ended Australia’s involvement in the Vietnam War and stopped state executions. It instituted gender equality through equal pay, universal health care and free access for all to the country’s universities and legal aid services. It replaced the British Honours system with the Order of Australia, established diplomatic relations with the People’s Republic of China, Whitlam being the first Western Head of State to officially visit the country, and voted for sanctions against the apartheid state that was South Africa. It adopted a policy of self-determination for and gave land back to indigenous peoples. It set up the Australian Heritage Commission and the Register of the National Estate to protect and conserve significant Australian sites, most notably creating the Great Barrier Reef marine Park. It invested in modern art, establishing major grants and famously buying Jackson Pollock’s Blue Poles for a then astronomical $US2 million. It did much more. And then it crashed, going out in a blaze of controversy, dismissed by the local representative of the Queen of England. In Australia in 1972, Gough was the catalyst for the future, for hope and change. He lived up to all the hope, and he showed a nation what real change was like. He created the modern foundations of the country that I grew up in and showed us how we could be much better than we were. He was a visionary, a political giant. And he’s now gone. And I’m sad. Vale Gough Whitlam. UPDATE: At a state memorial service held for Gough Whitlam on November 5 2014, indigenous lawyer and activist Noel Pearson delivered a stirring eulogy that brought home the many achievements of “this old man”. The roll call of reforms begins at the 9:25 minute mark.